Strong advocates are well informed about important policy conversations, understand how specific policies impact their missions, and have expertise and ideas for how policy can be best implemented. 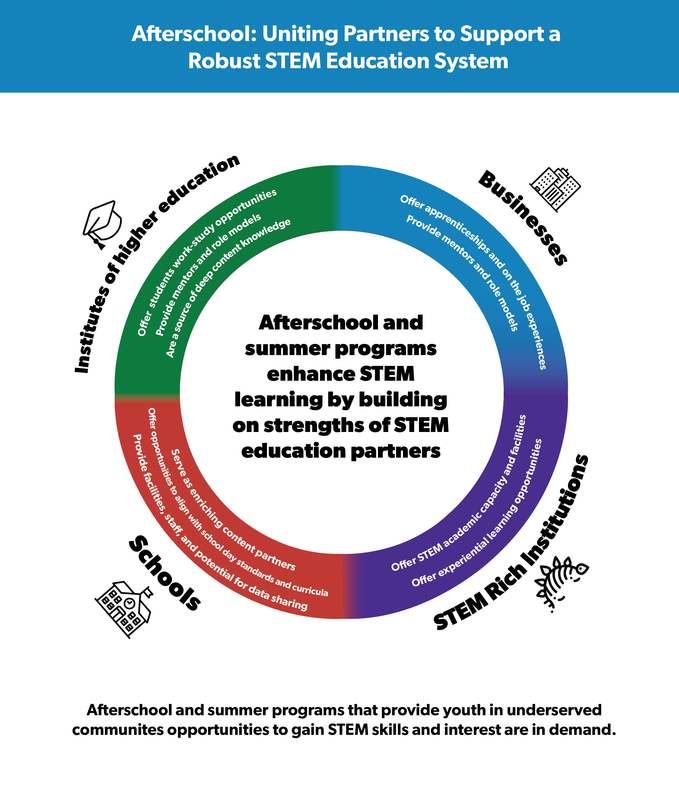 Whether you are looking to impact policy on the local, state, or federal level, the Afterschool STEM Hub aims to be a resource to help navigate that terrain. Policies that are closely aligned to our current best understanding of how people come to care about and pursue STEM learning will make the deepest and most sustainable impact. As you develop new policies or take a critical eye to existing legislation, use these research-based recommendations as a guidepost. 1. Are there enough high-quality afterschool and summer STEM programs for those who need it the most? There is a huge level of unmet need for afterschool programs in general—we need those programs to exist for afterschool STEM to happen. Fully funding federal programs that support afterschool and summer learning, as well as ensuring that community-based organizations are eligible partners for federal and state grants is a solid place to start. 2. Are there incentives to design programs that are strongly linked to positive learning outcomes? The research is clear on what productive out-of-school time STEM programs look like: (1) They are intellectually and emotionally engaging, (2) build on young people's prior interests and cultural resources, and (3) actively make connections across learning opportunities. 3. Is there a sustainable system in place to support a new corps of afterschool and summer STEM educators? In expanding access, we will need more educators who can facilitate high-quality STEM programming. It's important to identify opportunities to build bridges between formal, informal, and afterschool institutions and educators in ways that will benefit young people by building continuity and coherence across systems. 4. Are we expanding knowledge on how best to support STEM learning? Investments in an ambitious afterschool and summer STEM research agenda are required to better understand and document how STEM learning occurs across diverse setting, and over time, for a wide range of young people. Find more specific ideas here: Evidence to Policy: The Case for STEM in Afterschool.